One food that I’ve been meaning to try for some time now is sweetbreads, so when I saw them on the menu at Nice Matin this weekend, I snapped up the chance. Though the dish was described as a “fricassee” of sweetbreads, it clearly wasn’t done that way. (Similarly, Boyfriend ordered calamari “beignets,” which turned out to be simply calamari fritti.) 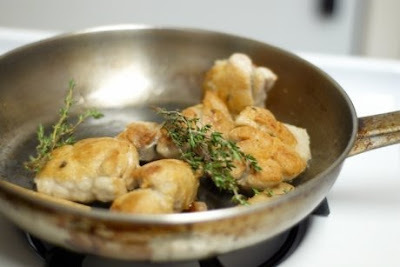 Rather, the sweetbreads were small nuggets dusted with flour and perhaps fine breadcrumbs, cooked quickly in a pan buzzing wildly with heat and a lot of butter. They were served atop soft polenta with slow sautéed mushroom and roasted chestnuts, another food I’ve been meaning to try. That meant two check marks for me in one night. Nice. It was listed as an appetizer, but it was actually a little heavy and would have been satisfying as a main course with a salad to start. The sweetbreads were delightful, though. The insides were soft -- I’ve been trying for days to come up with a comparison but to no avail. They are not as striated as a fresh scallop, nor as mushy as a cooked carrot, nor lacking any bite at all like pâté. Unlike a soft sausage, they had a perfectly uniform texture, even despite the fried outer layer. Texture is a great source of joy for me in eating, and I’m thrilled to now have the unique taste of sweetbreads as a new point of reference. The embarrassing regret I have is that I forgot to ask what animal the sweetbreads came from, as I understand both veal and lamb are common, and it was not specified on the menu.